Consumers are expressing the same concerns today that they did when 3D sets were first announced. Ever since the launch of 3D televisions, there have been two main complaints - the price and the glasses. They're the two things that TV manufacturers have had to fight against to get people interested, and still remain the biggest impediment. 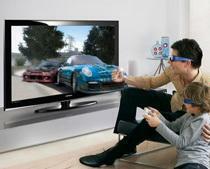 NPD analyst Ross Ruben says that as 3D TV prices drop, the glasses become more of an issue. "Glasses are becoming a more prominent inhibitor, and are poised to overtake price," he says. The NPD Group also reports that content is a problem. "While feature films provided a large library of content that could be readily converted to HD," says Ruben, "there wasn’t packaged media that delivered on the promise of the entertainment experience as Blu-ray now provides for 3D."